We have so many electronic devices in our house now. Large and small. I wonder if in the future it will be common to have 5 recycling bins in your kitchen. Paper, plastic, glass, aluminum and electronic. It’s already happening. A lot of recycling places around here also allow you to drop off your e-waste. You can’t get paid for it, and it hasn’t gotten to a household thing, but it is there if you look for it. 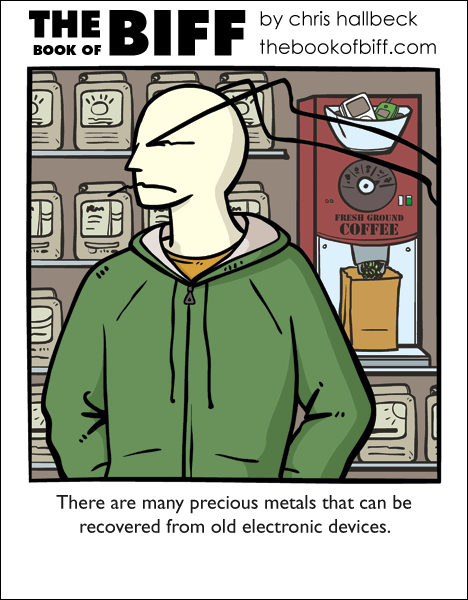 I don’t like coffee and I probably wouldn’t like a cup of joe with my MP3 in it… call it a hunch. wow 700th comic coming up soon! That ubiquitous “flat stomach” ad is showing up on the left sidebar, with the exposed stomachs facing right, which means that Biff is currently looking directly into the navel of the “before” stomach, which is, regrettably, far funnier than the punchline of today’s comic. Sorry. I just got finished writing a paper about e-waste when I saw this. I swear this happens every time I do research, the world just arranges itself into strange coincidences. Yea, the hoodie’d fellows get a sharp set of eyes in my department. But the ones my store has to look out for are the disheveled ones. I thought it would be interesting to note that there are some “recycling” places that will strip the gold and copper from your devices for you. You’d be surprised at how valuable the components are in things as small as ipods and hard drives. We only ever had two bins at my house: Paper and everything else. We have one of those multi-use bins–we can put any recycleable into it (even phone books and cardboard). I don’t think we can use it for electronics tho. @ Space Butler: It’s amazing how many people are caught because of their attempts to be inconspicuous. A weekly e-recycleable pickup would be cool. We have a bunch of junk hanging around because we never remember the once-per-6-month city electronics recycling event until the day after it happens. In the future we will not have a GARBAGE in my opinion! ACK! Stay away from my Game Boy! Now I have a place to put all those *ahem* “borrowed” electronics. Yeah, borrowed. Recycling is good. Having so many boxes is confusing though O.o I enjoy reading your comic. I don’t follow it habitually, but whenever I come back it always makes me smile. @Wendell – Lol, for me he’s staring at a chewed pencil. to whoever MADE that advert, WTF?! Paper, plastic, glass, aluminum and electronic? I have, so far, paper and food. Yes, FOOD. They thought, ooh, lets get people to recycle their food, we can get cheap fertilizer, and fine people if they put food in their normal bin. Which makes me wonder HOW they know there is food in the normal bin. Do they make monkeys search the bins? Yep sure love my coffee with lead and murcury!